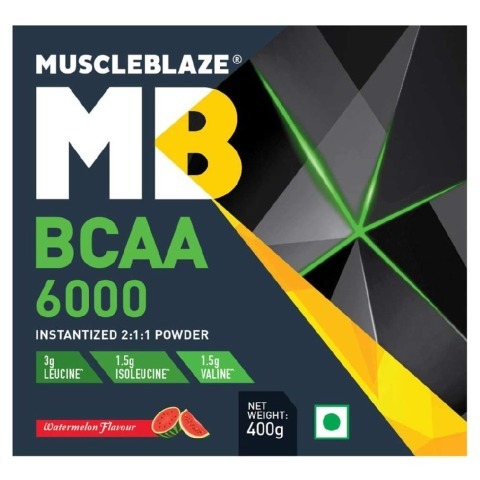 MuscleBlaze BCAA is a powerful intra-workout supplement which provides 6000mg of BCAAs per serving. Branched Chain Amino Acids play a vital role in muscle synthesis and provides faster recovery post a long and heavy-duty workout. Each serving of MuscleBlaze BCAA 6000 has L-Leucine, L-Isoleucine, and L-Valine in the ratio of 2:1:1 which supply the depleted muscles with the vital amino acids which helps muscle synthesis and prevents catabolism. 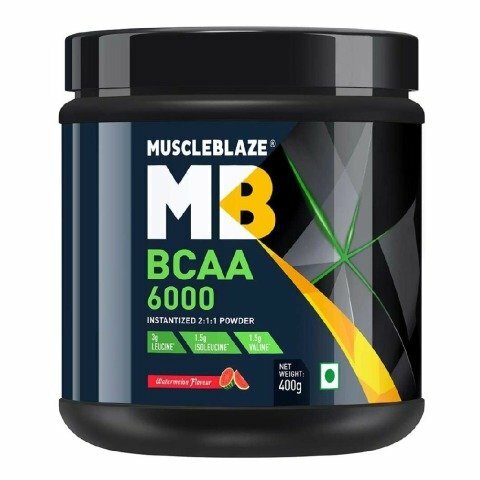 MuscleBlaze BCAA 6000 has an instantized formula so that it mixes instantly with cold water without leaving any lumps behind. 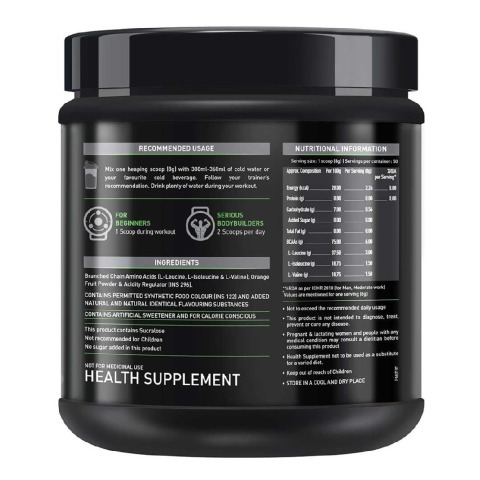 Branched Chain Amino Acids are a special group of amino acids which are used during weight trainings and active sports to support less muscle fatigue, faster recovery, and efficient protein absorption. 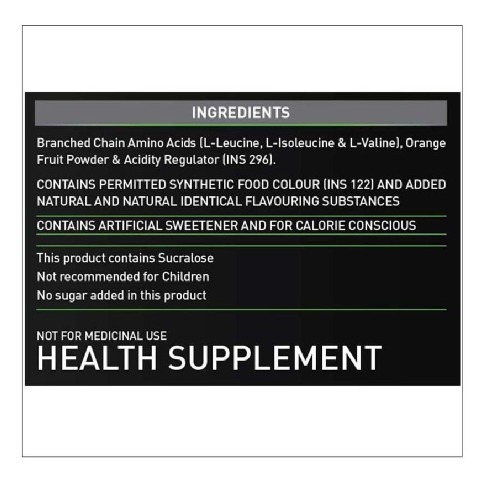 BCAAs include L-Leucine, L-Isoleucine, and L-Valine. Protein Synthesis: BCAAs increase muscle protein synthesis by providing an anabolic state and preventing catabolism. Protein synthesis stimulates insulin production which allows muscle cells to use it as energy. Energy Production: The BCAAs produce glucose and acetyl-CoA which is a precursor of fatty acids. As a result, all three BCAAs produce high amounts of ATP (energy molecules) while maintain the energy and glucose levels during workout. Regulates Leptin: BCAAs stimulate the synthesis of hormone Leptin.10 which is involved in the regulation of metabolism, weight, and appetite. 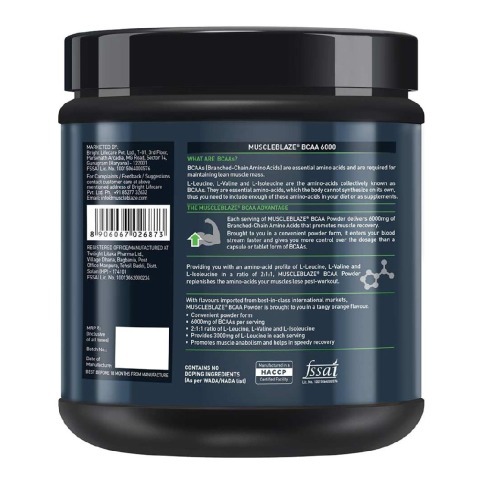 Delay Fatigue: BCAAs transport more blood through brain and decreases the production of serotonin, thereby lowering the mental and physical fatigue. 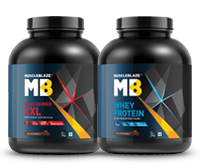 Reduced Muscle Loss: BCAAs have anti-catabolic properties as they prevent protein breakdown and muscle loss during the low-caloric intake diet. Mix one heaping scoop (8g) with 200-250ml of water or your favorite beverage. Follow your trainer’s recommendations. It is recommended to take plenty of water during workout after consuming BCAA 6000. Here is a snap shot of dose per weight and individual body weight. Many authorities agree that proper protein supplementation should be at 1.3-1.6 grams per kilogram of bodyweight daily for strength training athletes. Some studies indicate that 5.6 grams of BCAAs, two times a day improved weight lifting recovery and improved muscle stability. Another study indicating 3.6 grams, two times a day improved the recovery of rugby players. Ultimately, the dosage pattern shown above should be a good rule of thumb. At one point, the safe levels or the RDA (Recommended Dietary Allowance) for BCAAs were 20% of the total amino acids required for daily needs. 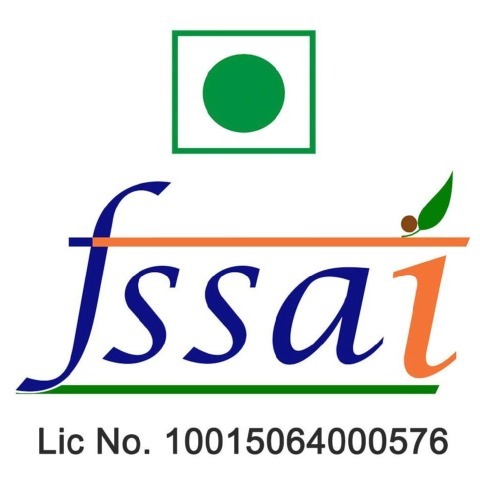 The established values for amino acids come from the FAO (Food and Agriculture Organization) and the National Research Council (NRC). The FAO and the NRC are the two bodies that are concerned with the studies related to the growth and development of infants and children. After closer evaluation of human needs, the requirement of BCAAs went up dramatically to the current levels of 40%. The changes in RDA levels and the BCAAs have changed dramatically in the last years. A number of studies that established the levels for BCAAs involved individuals fasting and living a normal lifestyle, and not in the quest to achieve more muscle mass or energy. Athletes are commonly one of the primary groups using BCAAs in supplemental forms. Proteins are the foundation of amino acids. In order to render amino acids form protein molecules, proteins must be digested via the gastrointestinal tract, the GI. This involves the stomach, the Hydrochloric Acid that is secreted inside it, its reaction with large protein molecules; then the secretion of protease inside the pancreas that helps in the breakdown of longer amino chains; and finally the breakdown into smaller fragments in the small intestine to form free amino acids and some small peptides containing the enzyme peptidease. Most amino acids are then subjected to transportation to the liver and undergo further metabolism in the viscera (splanchec) area and the stomach mucosal area. Free BCAAs are a little different in a way that they are directly carried by the blood through the liver. Whereas, some are exchanged in the intestinal viscera and eventually mix up in the bloodstream directly. Almost all amino acids can be degradated and broken down in the liver effectively with the exception of BCAAs. The liver oxidizes the BCAAs from their converted form called Oxo-Keto Acids. This means that the basic BCAAs are not metabolized by the liver directly. Ultimately, large percentages of the BCAAs are oxidized by the muscle tissue and some by fat (Adipose) tissue. But a large percentage of oxidation occurs in the muscle tissue (Organ Specific Muscle). Six amino acids are taken by the muscle tissue for energy that includes Alanine, Aspartate, Glutamate and the BCAAs. While the BCAAs have the greatest metabolic potential for energy use in the muscles, muscle tissues have 60% of the specific enzymes needed for oxidation (burning) of amino acids for energy. In essence, the muscle is designed to burn BCAA amino acids for energy. During exercise, the body uses BCAAs as energy. The longer and harder the workout, the more BCAAs that are used by the muscles for energy. It is estimated that, 3% to 18% of all workout energy is provided by the BCAAs. The bodies need for BCAAs, especially Leucine, is 25 times greater than the free amino pool or the readily available Leucine. The free amino pool is free or single amino acids found in the skeletal muscle, blood and cell plasma. (75% is in muscle). Free amino acids are amino acids that are not bound, but are ‘waiting’ to be used. Because of the great need for Leucine, the body must catabolise or breakdown the muscle for the Leucine needed during a workout. BCAAs can also be converted to Alanine or Glutamine inside the muscle. Alanine and Glutamine can go through glyconeogenesis in the liver to form Glucose. Ultimately, Leucine is one of the major ‘foods’ for the muscle during workouts. BCAAs when consumed in free form, bypass the liver and the gut tissue and go directly into the blood stream. Supplemental consumption of BCAAs quickly elevate the blood supply and affect the circulating BCAA levels. This is especially true when there are low levels of glycogen or stored sugars. BCAAs supplement have shown beneficial effects when taken before or after workouts. While large dosages of single Leucine are not recommended by some authorities, the use of BCAAs might be best in combination with other supplements. Prevention of fatigue with the help of BCAAs in athletes can occur in two primary ways. First, the loss of ATP or cellular energy occurs with the loss of stored glucose in the form of glycogen. ATP levels are maintained by the BCAAs degradation and fatty acid utilization after glycogen depletion. The effect of BCAAs as energy is approximately 3-18% and possibly more, depending on the duration or the intensity of the workout. Muscle tissue can oxidize Leucine for energy or convert Leucine into Glutamine or Alanine for blood energy. Glutamine or Alanine can be converted into Glucose. Also IsoLeucine and Valine can be converted to form Krebs cycle components for energy as well; making all three BCAAs a valuable source of muscle energy. The second primary fatigue fighter for BCAAs is seen with the BCAAs ability to prevent central fatigue in the nervous system. Central fatigue happens with the uptake of Tryptophan by the brain, increasing the levels of Serotonin. Serotonin increases tiredness and fatigue, demanding the rest to the brain immediately. BCAAs inhibit the brains ability to uptake Tryptophan. For endurance athletes, the use of BCAAs before and after workout has proven to be effective in reducing total time taken for the completion of events. In other words, it has increased the performance abilities. Cyclists and marathoners have shown positive effects when using BCAAs immediately before events and during an event. Improvements in mental performance and reduction in performance time have been noted. The reduction of lactic acid levels have been shown in some studies (reduced burn). Loss of muscle mass has also been reduced. Two weeks of supplementation has shown improvements in time-trial of cyclists and other trained athletes. It is also noted that some studies indicated no improvements. Some studies however, have compared BCAAs to glucose, while some formulas today have the two together, a dosage of 3-20 grams a day, taken before, during and after workouts. Most studies indicated the consumption of 7 to 12 grams during long events mixed into carbohydrates solutions for best results. Recovery from a workout as well as increased energy can be accomplished with the use of BCCAs. During exercise, when muscle contacting tissues are being degradated for energy, non contractile muscle proteins decrease in catabolism and inversely with the reduction of exercise. In addition, the breakdown of contractile tissue increases during post work recovery. So increasing the usage of BCAAs before and especially after workouts has been a norm for years, producing a ‘muscle sparing’ effect. In addition, the stimulation of muscle synthesis and the use of BCAAs have required large dosages of these three amino acids. Most researches point to Leucine as the amino acid that stimulates this action when consumed with other supplements or as a part of a meal. BCAAs have been used for muscle recovery extensively. Exercise recovery and the degradation of proteins are reduced with the use of BCAAs, especially Leucine. As noted above, Leucine has a signaling effect on key enzymes for protein synthesis, having an anabolic effect on human muscles. BCAAs usually are coupled with insulin and IGF-1. Recent research has confirmed that Leucine increases the Adipocytes (fat cells) release of fats for energy. In addition, Leucine been proved to be a key factor in the prevention of muscle tissue degradation during dieting in diabetic situation. Most dieting solutions increase the loss of lean tissue and increase muscle loss. Having adequate Leucine and protein will prevent this loss of muscle during dieting. Studies related to experimentation of higher dosage of BCAAs in rats - an excess of 15 grams per kilo gram of body weight, have shown to decrease B3 blood levels and tissue levels. For a 100 pound man that would be about 750 grams. Based on the dosages as listed above, it is always good to make sure that enough b-vitamins the supplement program maintains a high protein level in the body. Acceptable dosages seem to be around 4-20 grams, depending on body weight and event of use. 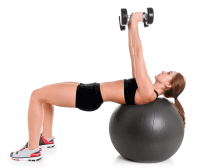 Bodybuilders, weight lifters, and other athletes who weight train regularly. Endurance athletes who regularly compete in aerobic events, such as running, cycling, or swimming, will also benefit from supplementing withBCAAs. DO I GET ENOUGH BCAAS FROM THE PROTEINS I GET? Dairy and red meat contain the greatest amounts of BCAAs. Other sources include whey protein and egg protein. Although they are present in all foods containing protein, there is a definite advantage to supplementing your diet with additional BCAAs. This is especially valid before or after training in order to obtain the greatest benefit that these exceptional amino acids have on muscle building. 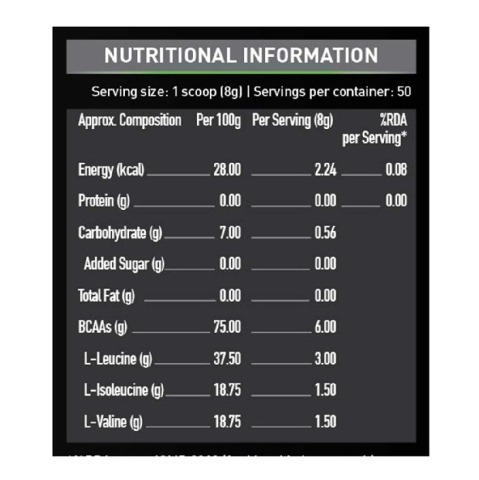 HOW DO BCAAS HELP ME IF I AM DIETING? BCAAs can be used as fuel (energy) by the body like mentioned above so if you are restricting your calories and your body needs energy or fuel it goes to your muscles and your fat to get that fuel. We obviously want it to go after the fat, but we don't want it to go after the muscle. By providing your body with BCAAs throughout the day will allow it to use those for fuel if needed and prevent your body from getting the BCAAs from your muscle, which can cause loss of lean muscle. If you do not get in enough protein through regular food or other supplements then it is a good idea to continue to use BCAA particularly if you are dieting or trying to build lean muscle through strength training. WHAT IF I WAS A PREGNANT WOMAN, LACTOSE INTOLERANT OR DIABETES PATIENT? For a lactose intolerant person, BCAAs would be a very safe and highly effective supplement. It is devoid of lactose and it only constitutes branched-chain amino acids. For pregnant women and diabetes patients, I would rather suggest consulting to a doctor or health counselor before taking it. WHAT KIND OF RESULTS SHOULD I EXPECT FROM BCAAS? You can expect to see an improvement in the effectiveness of your training sessions and reduce muscle soreness and fatigue. BCAAs can improve nitrogen retention so that your body stays in an anabolic state for lean muscle development, which results in prevention of devastating lean muscle tissue breakdown. WILL IT BOTHER MY STOMACH? No it should not bother your stomach. We consume Amino Acids every day with protein meals and these Branched Chain Amino Acids are of the same chemical design. BCAAs are just amino acids with nitrogen retention power.